When dressing yourselves for the day do you only concern yourselves with the external? How much more important it is to clothe ourselves with Christ, not only for ourselves, but for others you will encounter throughout the day. We not only have a glowing countenance from allowing Him to fill us, but also our behavior will be totally different from our selfish nature. We will be dressed in His love and grace guided by His wisdom from above. These are garments that never age or wear out. They haven’t been purchased with gold and silver, but with the imperishable blood of Christ. Partake! His clothing store is available to all at all times! 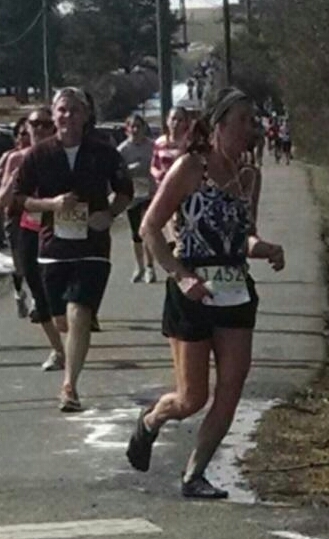 I clothed myself in His strength and running attire to participate in the Blacksburg Classic 10 Miler in Blacksburg, Virginia this past Saturday placing second in my age division. Photo was taken at a turn on the third mile. Lovely afternoon with mild temperatures and occasional sunshine!